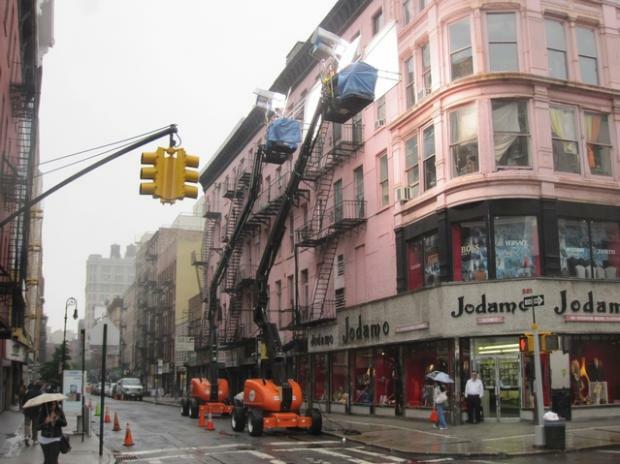 LOWER EAST SIDE — The streets of the Lower East Side and Chinatown were transformed Monday into a film set for the post-9/11 flick "Extremely Loud and Incredibly Close," starring Academy Award-winners Tom Hanks and Sandra Bullock. The New York-based film — an adaptation of acclaimed author Jonathan Safran Foer's 2005 novel about a boy searching for clues following his father's death on September 11 — used both Eldridge and Orchard streets as backdrops for scenes Monday, despite the rainy conditions. The story's narrator, played in the movie by young actor and former "Jeopardy!" winner Thomas Horn, embarks on a quest for answers upon finding a mysterious key belonging to his father. Large equipment trucks and trailers stretched along numerous streets in the area during filming Monday, as large cranes were used to shoot scenes at the corner of Orchard and Grand streets. The film, directed by Stephen Daldry, is expected to be released next year.